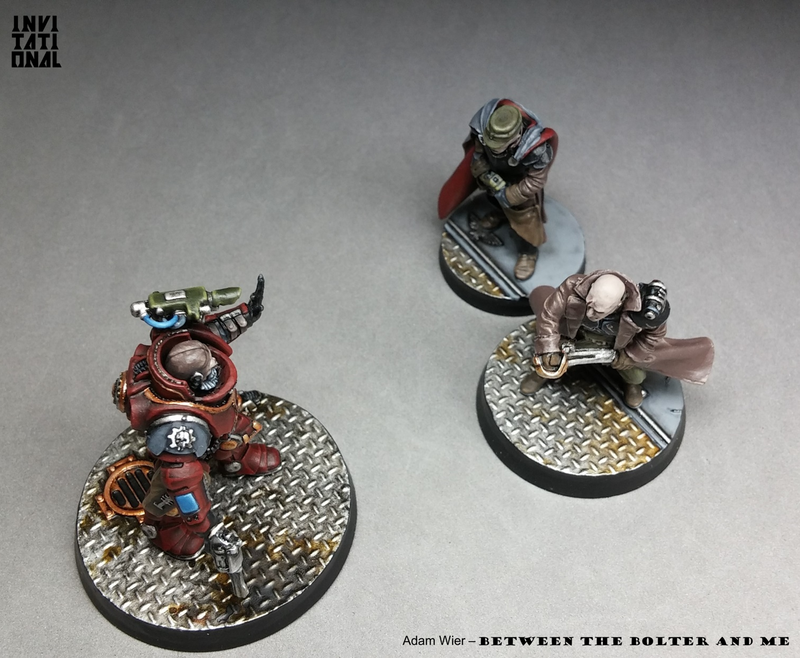 From the legendary Wier brothers, of between the bolter and me, comes an installment of Inquisitors. This entry makes us perhaps happiest of all of them, as after many long years Adam has picked up the brushes again spurred by the Invitational and really delivers. For us to help make this happen is an honor and absolute joy. Over to Adam. When asked to take part in the Iron Sleet Invitational, I knew I wanted to explore the Inquisition. In a game (Warhammer 40k) that is so focused on massive armies battling against one-another, it is often easy to overlook the plight of individual characters. The personal struggles and inner turmoil, the conflicts of ideology, and shadow wars present in the clandestine world of the Inquisitors is the aspect of the game that interests me the most. Therefore, in this Invitational, I wanted to Focus on the Battle for the Emperor’s Soul. Recent Games Workshop publications (see Codex Inquisition) make the Inquisition into a black and white organization of good Puritans and evil Radicals, more caricatures than actual characters. With this Invitational, I wanted to go back to the more nuanced and interesting aspects of the Inquisition. Afterall, everything you have been told is a lie! Soljic was the first model I created for the trio, and sort of embodies my vision of an inquisitor, a pragmatic individual that does not flaunt his influence and tries to blend in with Imperial society. Instead of power armour, storm bolters, and thunder hammers, he carries only essential items that would not arouse caution, a leather coat, a holstered sidearm, and a power sabre. 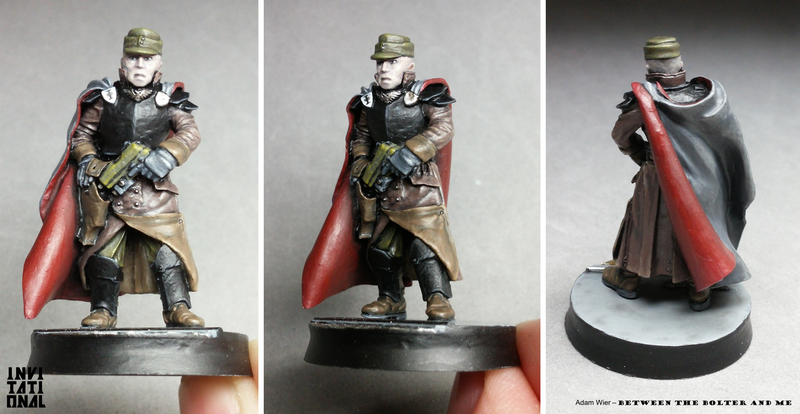 The entire Invitational entry formed around the pose and reserved tone of the Death Korp Commissar model the conversion was based on. The simple drawing motion shaped my idea of a confrontation breaking out between two inquisitors. To enforce the undercover notion of Soljic, I painted everything in dull earthy tones instead of the common black and red color scheme commonly seen on Inquisitors. Nils Fernow was the second model I planned out and built for the Invitational. The model is sort of a continuation of the themes and ideas seen in Soljic. He too dons a trench coat and is in the process of drawing a weapon. Instead of a sabre, Nils is drawing his holstered sidearm. Since none of the standard 40k pistols are really at a believable scale, I ended up converting a pistol reminiscent to a modern polymer automatic. In addition to the pistol, I pushed out of my comfort zone for this head, using the helmeted Karl Franz one as a base. It required that I shave away the majority of his helmet, and then sculpt his ears. Although it was a lengthy process of resculpting and repositioning, I am quite happy with the result. For the final model, and second inquisitor, I wanted to go in the opposite direction. I wanted him to be less cautious about his identity as an inquisitor. Instead of wearing run-of-the-mill fatigues and an overcoat, he would be wearing a custom suit of power armor. Despite a more brazen appearance, I still wanted to ensure the model had a reserved quality, giving no indication towards his placement along the thin line of radicalism. My main concern with the model was distancing him from a Space Marine. I did this by removing the characteristic backpack and shoulder pads of an Astartes’ power armor. I also made his leg and arm armor much thinner than normal power armor, giving the model more finesse rather than simply brute force. To emphasize his ties to the Mechanicum and contrast with Soljic, I decided to paint his armor red. There are still several small details that I have not finished on Molnár’s paintjob. I want to do some freehand work on his left shoulder guard. Additionally I am unsure of what to do with the blank screens on his armored bracers (simple text?, an =I= to represent a kind of screensaver while not in use?). Finally, his armor might benefit with some form of battle damage and scarring. Thanks for the kind words; it is humbling, as your work has been a constant inspiration for me over the years. I love how rich the 40k universe is, allowing so many different styles and themes to be explored, from your gritty, grimy, and gothic style to my more reserved militaristic tendencies. I really think you nailed it Adam. This is a perfect little mini diorama and capture the tense situation extremely well. I’m also very fond of your general take on this as it reminds me of what I read about the inquisition in WD when the 54mm game came out. I am glad you like the scene, and am excited that it dredges up memories of the old 54mm game Inquisitor. The release of that game was revolutionary to me, and has really shaped my vision of the 40k universe, and was the primary inspiration for the models! Mindblown! I absolutely love all of them:)!!! The guy in the power armour is my favourite, nice sculpting work there! Thanks! I was incredibly pleased with the power armor, and how all the sculpting came out. I admit I was a bit skeptical at first to whether I could make it all work, with only vague ideas and notions of how I wanted it to look. Bravo! Everything is really completed. But I prefer is the inquisitor in armor. Really of the good work! I am pleased you like them all! I admit, I am really fond of Molnár’s power armor myself. It came out better than I could have hoped. It’s a great exemple of a sleek painting style also got his place in the 40k’s universe. I second Mikko with Lucanus Molnár . One of the best power armoured inquisitor kitbash I’ve seen for years. Yeah, I have always been a fan of a more subtle, sleek painting style, eschewing bright flashy colors in favor of drab functional ones. I am glad you like the power armor. For such an icon type of armor, I realized there are very few examples of any of it that is not Astartes grade, and wanted to explore alternatives with Molnár. Simply superb mate – not much more to say that I haven’t already said on the build posts. The red on that armour is lovely. The overall look is great. Its such a novel twist on the power armoured Inquisitor – totally distinct, totally your own. Special shout out on the bases – they game up a treat. Congrats on a group of great entries. Thanks for all your support and suggestions throughout the process, constructive feedback really can do wonders. I am also glad you like the bases; it was rather new to me to create my own bases. I have become so fond of Dragon Forge ones for their simplicity and quality, that I have not ventured into make my own very often. It has been a big learning experience, one that I hope to push even further in the future. Cracking stuff. I’m blown away by the beautiful subtlety of the painting. It is good to know people like my painting style, and that it still holds up after all these years! I really enjoy trying to create subtle blends with a brush. Excellent vignette, I really like how the three miniatures interact with each other. With only three minis and no background scenery, you still manage to tell a story. When starting out, with only the image of the models in my head, I was not sure if they would all come together, and that I might need to create terrain to go around them. But I am happy that I do not think it was needed in the end. Thanks for the kind words! These are really amazing. I know a ton of work went into each model, but what I love about them all is the simplicity of their design. They all have a subtlety about them (even Molnar in his power armor), that makes them believable. All of the Inq-games are rife with bombastic characters, but it’s quiet pieces like this that give a kind of grounded realism to the background. Well done. Thanks! I have always really like the subtle realism that was portrayed in the Inquisitor rulebook, of that fine razor edge between the puritan and the heretic. Like what Dan Abnett created and wrote about with his Eisenhorn books. I wanted to capture some of that in these models. Along those lines, I wanted to add a lot of detail and interesting elements to the models, without it affecting the practical nature of their work. After painting all the models, I think it really tied the models together and grounded the models even more in realism. Molnár is one darn impressive inquisitor. Really like how you’ve explored one of the lesser known ordos with him. Thanks! I am pleased that my efforts to create more modern detective sort of Inquisition operatives was apparent. It is an element of the 40k universe that I am really interested in, and feel it gets overshadowed at times by crazy warp mutations and overtly radical inquisitors (which I am also very fond of). Wonderful! Such crisp and rich painting. The power armor is amazing, and I really love the oil-stains on the gleaming metal grating on the bases. Thanks for the seal of approval on the painting. I was a little worried having not painted for so long that it would be hard to get back into the swing of things (fortunately it all largely came back, ha ha). I am glad you noticed and like the stained metal flooring. The new GW metallic paints and washes are much different than the ones I remember using years ago (mostly from around the second edition of 40k… mithril silver, boltgun metal, etc), so it was an interesting learning experience. Lucanus Molnár is one of the most brilliant and detailed builds and one of the highlights! Excellent executed. 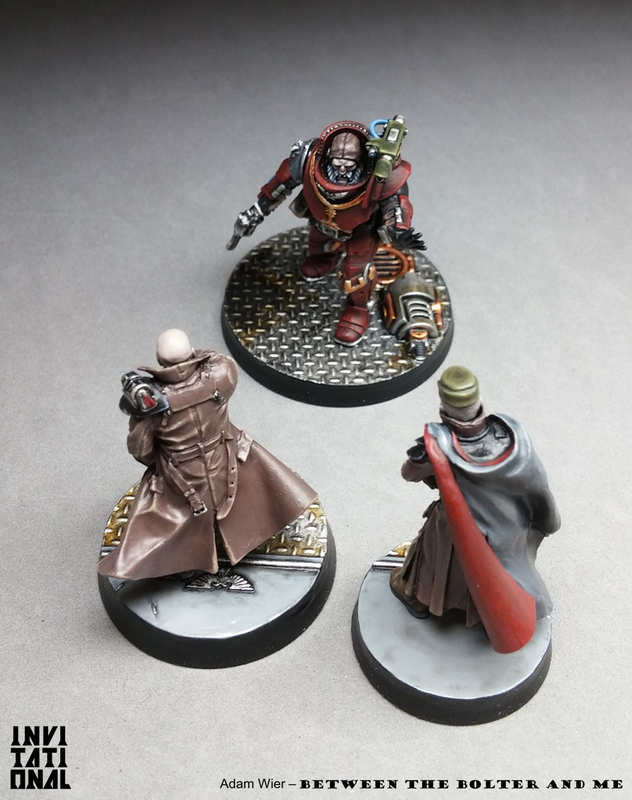 I love the muted colours on Soljic and Niels, but again Molnar excells with his deep red handcrafted Power Armour. I agree, some small amount of battle damage here and there would do wonders. I am not sure about the =I= on the braces – it could look good, but maybe some sort of screen grid would work better: At least something, which shows that they are in fact a screens and not blue emblems with an =I= on it? With so many fantastic models present in this Invitational, it is quite glowing praise to be considered a highlight, thanks! I too am fond of the muted colors of Soljic and Nils, and how that contrasts a bit with the more extravagant, but still dark red of Molnár. I will have to consider adding some damage to the armor. Additionally, I think you are right that I should make it is apparent that the little screens on his arms are not little emblems. A grid like you suggested would probably work pretty well. Wow I really love Soljic, he’s the most normal looking 40k mini I think have ever seen, so understated and yet, your conversion has those little touches which still indicate his authority and presence. Lucanus too is a wonderful example of subtle converting and kitbashing, even though he’s a more prominiantly visible inquisitor with his customised power armour, he’s still looks fairly normal and realistic. Hey there! Fantastic work. I’m really blown away by all of it and it has inspired me to start playing Inquisimunda, or =I=munda. Sorry if I missed this somewhere in the text, but if you don’t mind me asking, what system are you using if you’re using them to play? Is there a specific Inquisitor/Necromunda rule set that you favor?